The Dead End of Identity Politics. Pull up a chair. I have a story to tell. A former colleague of mine posts this on Facebook. Makes you wanna give it an eyeroll or two, right? There is nothing in this critique that one can use to organize or build community around; rather it is simply one more scold in an atmosphere full of them. I challenged the person who posted it to find me something similar on how you can build bridges or educate the mass of people that we will actually need in order to build a coalition for change. She replied that she was not necessarily using it to exclude folks from spaces; fine, I said. I do not understand how one can post something like that and say with a straight face that they “are not trying to exclude”, but I was ready to let it go. A socialist organizer friend of mine weighs in on the fourth point. I read it and….huh. It kinda does sound like the poster is blaming white LGBTQ+ individuals for their own oppression. I mean, I can kinda see the point (these struggles are connected, and one oppression fuels others), but it was made in such a bombastically ridiculous way as to lose the point entirely. And knowing the struggles that white LGBTQ+ youth endure in the South, this particular admonishment came across as being very unfeeling and insensitive. Everyone cannot be an organizer. Fine. But please, do not politicize your laziness and comfort. Did you just call me lazy? Did you not hear me say that I am a queer Black woman…. What conversation is there to be had around that? It is as if the mere existence of her identity inoculates her from any critique. How did we get here? 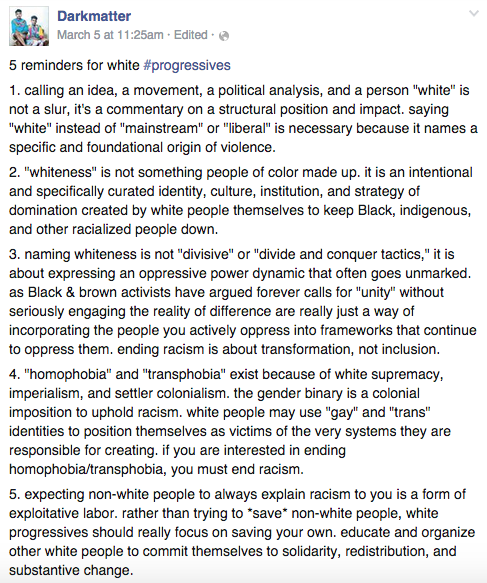 Continue reading The Dead End of Identity Politics. Further Thoughts on Call-Out Culture. Power and Privilege: The missing element of our Charlie Hebdo debate. The concept of privilege — whereby one gains certain benefits due to their membership in a sociological group that has a measure of power — is one that has been hard to talk about in recent years. Too often, the concept has been hijacked by those who use it to shut down discussion and tar people that they find disagreement with. Even when it is not being used to that effect, you can peruse sites like Identities.Mic and see the most base and childish discussions of power and privilege imaginable. Take this article by Derrick Clifton, which assumes that no one cares about the bombing of a NAACP office in Colorado because it is not wall-to-wall coverage….on the same day that a shooting kills twelve people at a newspaper office. Given the aforementioned example of the simplemindedness that accompanies many online discussions of privilege and power, it is somewhat understandable that leftists have avoided a discussion on privilege when it comes to Charlie Hebdo and the shooting that killed 12 of its writing staff. Many of the debates have centered around issues of free speech, the possibly bigoted nature of some of its attempts at satire, and whether satire should be given wide berth to offend in the pursuit of making people think. These topics seem actionable to a degree, and offer a measure of possibility when it comes to political action. Because contemporary discussions of privilege are so badly broken and given to unsightly episodes of social justice performance, it seems that it would be for the better to just ignore the discussion altogether. But without the consideration of privilege and power, any conversation about this situation will be incomplete. Continue reading Power and Privilege: The missing element of our Charlie Hebdo debate. The Day After: Ferguson’s aftermath, and the charge laid upon our communities.